krayZeeMoMmie: Quiznos - Printable Coupons! 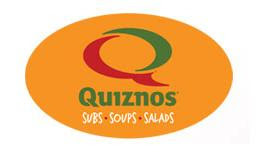 Quiznos has just released more printable coupons! $1.00 OFF Any Choose 2 Combo, includes purchase of a Choose 2, a regular fountain drink and chips or a cookie. Free Regular Fountain Drink with purchase of any sub, regular chopped salas, toasty Torpedo or Choose 2.